The average medieval European did not do much travelling. Most people tended their land and went to the local town for markets, fairs or religious occasions, but had no reason to go much further afield even if they had the means and the time. Of course some did – the great and the nobles, travelling minstrels and some soldiers for example – but most people living in Europe would never have seen a map (for none existed that we would recognise today), nor would they have any concept of the distance between them and the Holy Land, except perhaps in terms of the number of weeks or months such a journey might take. Nevertheless many thousands did make that journey, not only on what we now call crusade but also for the much more peaceful pilgrimage, and for that they would need provisions (and of course cash). Most would have walked, but the lucky ones would have ridden. Baggage was either carried or piled on pack animals or put on carts. With such goods as they could muster people set out on what was an epic journey on dreadful roads and tracks to a very uncertain future in an alien land. The somewhat eclectic contents of this first crusader transport set from Strelets begins with three named individuals – the first three figures in our top row. First we have Richard I of England, known as the Lionheart, who is most famous for going on crusade (1189 – 1192). Here he wears mail and a surcoat, but has no helmet and has his mail hood down, so despite holding both a sword and a shield does not look in particularly martial mood. As can be seen from the image of the sprue, his right arm is separate, and attaches to a peg on his shoulder really badly to make a highly unconvincing pose, regardless of where you point the sword. Next to Richard we find Baldwin IV, King of Jerusalem from 1174 until his death in 1185 at the tender age of 24. He wears a mail suit and a surcoat plus a cloak, and on his head he has a helmet with neck curtain. This is perfectly reasonable, but he also wears a full face mask, which is not a part of the helmet. Baldwin was a leper, an affliction that caused him to lose the use of his right arm as an adolescent, to similarly lose feeling in his hands and feet a little later, and to go blind by 1182. However there is no evidence of any significant facial disfigurement, nor that he ever wore a mask, so why is he wearing one here? Sadly the answer is probably that most malign of supposed history lessons, the cinema. In the film Kingdom of Heaven (2005) he was played by Edward Norton and always wore a mask, to make him seem a more sympathetic character to the audience. The film was justly ridiculed for its many historical flaws, although as an entertainment there is no reason why it should strive for any degree of accuracy at all. So, did Strelets know this and make the figure because they thought that is what the public wanted, or were they lazy in their research? The answer really does not matter, because whatever the cause we have a figure which is going to be pretty hard to find any use for, unless you want to bypass history and recreate famous movies instead. Still on row one, third in line there is Peter the Hermit, leader of the disastrous People’s Crusade, which was wiped out in North-West Anatolia in 1096. As a holy man he wears the habit and has a monk’s tonsure, and is in the process of flailing himself. Flagellation was supposed to be a means of penance, so perhaps he is punishing himself for his failure, although doubtless such a zealot would find plenty of reasons to consider himself unworthy. Since these three individuals are not all contemporaries this set is clearly not aimed at any particular crusade or specific year, and the rest of the figures must therefore be seen in the same general light. As a result all look to be quite authentic for some part of the long crusading period, both the military and apparently non-military ones. The man at the start of the second row wears a rather unusual helmet with a sun shield; helmets came in many designs and perhaps this is one of them, but we would observe that if this man is simply on the march then he would be loathed to suffer the terrific heat and discomfort of a full helm unless trouble seemed very close. The figure fanning himself with a large leaf seems more plausible, as do the others, particularly the standing figure well wrapped up in local clothing. The woman looking sideways in the third row is particularly interesting because we are not sure what she is supposed to be doing. Clearly seated, she cannot be riding side-saddle because her legs are not correctly positioned for that, and riding side-saddle was not invented in Europe until well after the crusading movement had virtually died out. If women rode then they would ride pillion, but none of the horses in this set are provided with a pillion seat. The set comes with six horses and four mules to share between the nine (or ten) riders. Although naturally the kings would get horses, as would the knights, you can please yourself who gets what animal except that many of the figures do not fit into the high medieval saddles and even if they do their legs tend to be too close together and make them ping off again. For some reason the mules have pegs protruding on top and each side, but these have to be removed to allow someone to sit, and there is no baggage to place on these pegs should you wish. The horse poses vary between acceptable and very bad, and several are apparently at full gallop – hardly appropriate for the slow, marching figures we have in this set. The mule poses are much better, and all the saddles and harness on all the animals look OK. The two oxen are presumably the team for the wagon, and look reasonable enough, but the wagon has a number of issues. It is a very simple box wagon with solid, square sides and a bench at the front on which the driver and friend sit. There is virtually no undercarriage – just two axles on which the body lays directly, so this is a very simplified model. The wheels are the same size front and back and look very small (about 12mm in diameter), although we could not be sure that this was wrong. Four-wheeled wagons were very expensive and difficult to manoeuvre in the medieval period, so were very rare. Much rarer still were ones made with solid sides like this, for they used more wood and were heavier. Much more likely were ones with simple rails at the sides, or else sides made of wattle – solid sides would only be necessary for loads of some small items such as root vegetables. Taking one like this all the way to the Holy Land would seem like a very unlikely choice. There is also a glaring yet surprising historical error even in such a basic model. It has been given a pivoting front axle, and this is a matter of some debate amongst historians of the Middle Ages. It was only proved that the Romans had such steering axles in the later part of the 20th century, and this and other features were lost after the fall of the Western Empire. Amazingly Europe would not rediscover pivoting front axles again until the 14th century, long after most crusades had finished. Luckily this is easy to fix by simply gluing the front axle to the body! The parts of the wagon fit together but this is a fairly crude kit. The small wheels mean the floor of the wagon is at people’s knees, which looks quite silly to us. Also the whip in the hands of the driver would at best be able to tickle the very end of the oxen tails as it is much too short to do anything more useful. 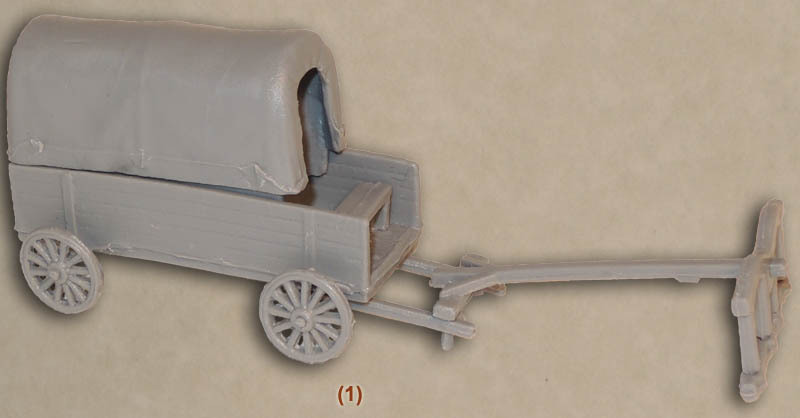 The wagon has a lot of not quite straight sides and a lot of ugly marks where it is attached to the sprue, so should you wish to really make a nice job of the model it will take a lot of cleaning up. There is no problem with flash however, and the chosen poses mean they do not look at all flat. There is a separate shield which seems intended for placing on one of the horses, and a small lump that looks like a badly deformed helmet with a partial hole for which we could think of no useful purpose. Large heads, exaggerated smaller details and the like mean these are the familiar Strelets style, so they match the other Strelets knights well enough, but not much else. For an army on the march the figures are well posed but the same cannot be said for the horses, most of which are highly unsuitable. The separate arm for Richard and the wagon once again reveal how Strelets’s laudable ambition is well ahead of their ability to deliver, but there is a reasonable amount here that is of interest. However by discounting the galloping horses, the crippled Richard, the masked man and most of all the wagon there is not a great deal left, so this set disappoints more than it pleases.